Begin your purchase by signing the Crystal Seed Agreement Form. Return/refund policy: May be returned within 15 days of receipt if unused, in good shape and within its original shipping materials. There will be a 15% restocking fee and product must be in “stockable” condition. Buyer is responsible for shipping and liability from damage in the course of returning Product. After fifteen (15) days of receipt, Products MAY NOT be returned for any credit or refund. Crystal Earth Seeds are healing tools designed to engage and amplify the nourishing energies of Mother Earth. They support alignment with, and attunement to, the higher frequencies of the earth and cosmos. Placed in your environment, a Crystal Earth Seed can promote physical and spiritual transformation. 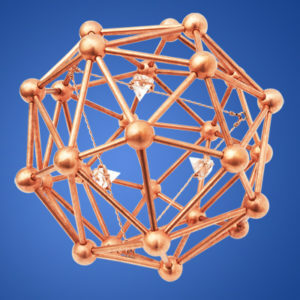 The gem-like copper structure of the Seed encircles and protects three small quartz crystals. These crystals create a vortex through which primordial earth energy flows. Crystal Earth Seeds are also being planted in the ground in sacred places around the world to engage and reinforce our planet’s existing crystalline grid. This will help elevate humanity’s collective awareness to align with the enlightened frequencies of Mother Earth.